Offer files to new signups using this simple service for creating forms, hosting assets and sending download emails. 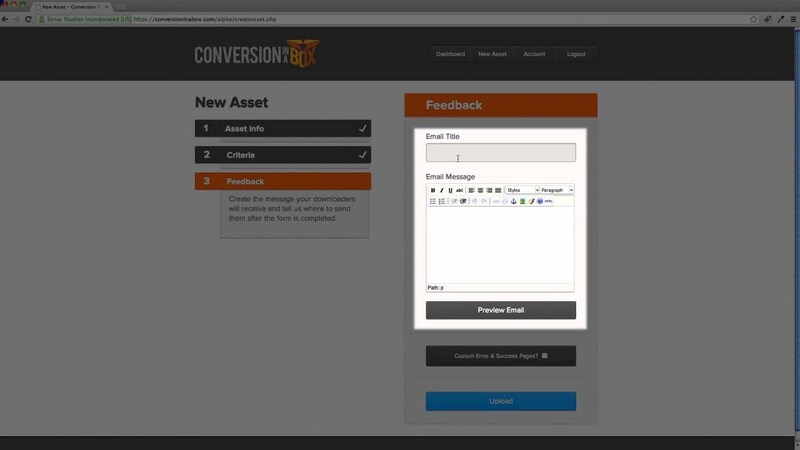 If you have a whitepaper, ebook or file that you would like to offer upon sign up to your email updates, Conversion In A Box provides a simple solution for not only creating forms, but hosting files, sending confirmation emails and monitoring consequent downloads. Using their form builder, you can generate the code for a simple form within moments, then leave it to their service to deliver your files (known as assets). It’s a win-win way to drive conversions on your site, or for your clients. Using the built-in integration with Campaign Monitor, it’s possible to either automatically sync new signups with an existing list, or push them in one batch. Here’s a quick video that explains the setup process. Once set up, you can add an opt-in checkbox to your form to ensure that all signups are happy to be contacted via email, then set and forget. Conversion in a Box has a variety of pricing tiers, including a free plan, to suit the bandwidth and leads you require. To find out more, visit their site.